The oldest references to the sport in India can be dated as early as the year 1725 when some sailors played a friendly match at a seaport in Kutch. By the year 1792, the Calcutta Cricket and Football Club had been formed, and a yet another Cricket club had been formed at Seringapatam by the year 1799. Calcutta Cricket & Football Club, founded in 1792, is one of the oldest sports clubs in the world. 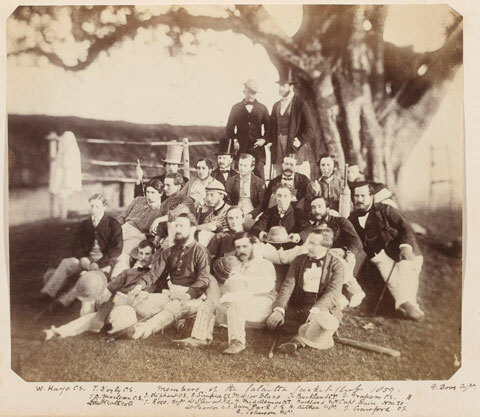 The photograph on the left shows some members of the Calcutta Cricket Club watching play from under a banyan Tree in 1859. In the absence of a permanent venue, the Calcutta Cricket Club played its games on the esplanade, parallel with the river Hooghly, between Fort William and Government House. By the 1820s, the members felt the need for a permanent ground. 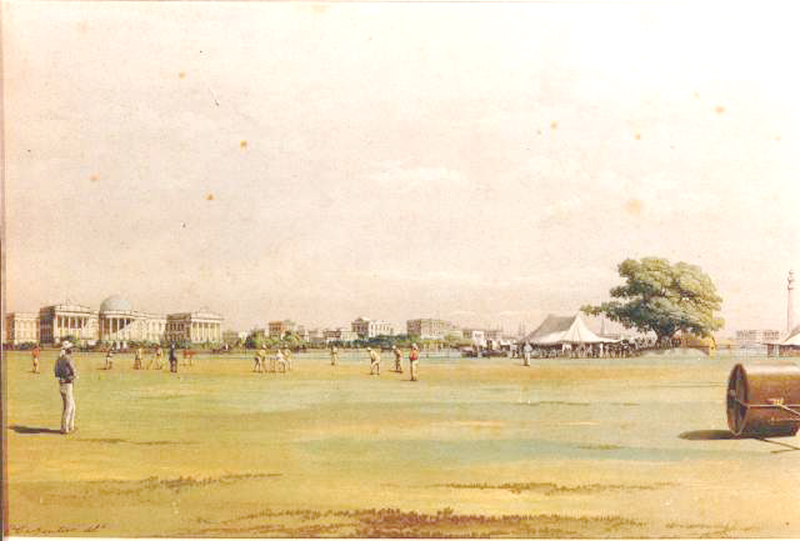 In 1825, the Calcutta Cricket Club managed to obtain the use of a plot of land on the Maidan. In 1841 the Club was relocated to the eastern boundary of the Auckland Circus Gardens. The Club made several representations asking for permission to ‘erect a suitable pavilion and finally on 19 April 1864 the long awaited approval arrived. A handsome and well built pavilion measuring 125 ft by 25 ft was promptly constructed out of the finest teak brought from Burma. The pavilion no longer exists. It was pulled in the mid 1970s for the construction of the Cricket Association of Bengal’s modern B.C. Roy Clubhouse. 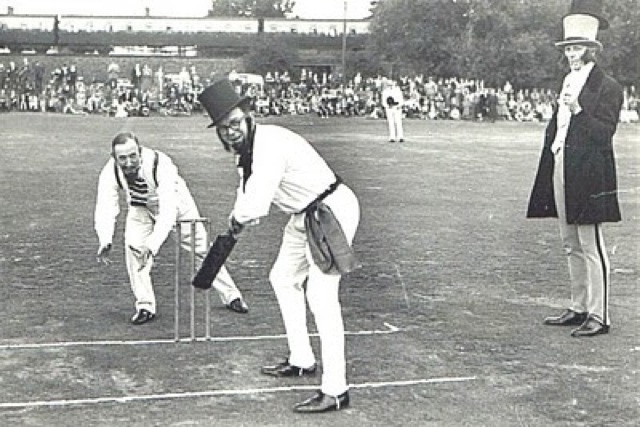 The most famous of all sports clubs – the Marylebone Cricket Club – was founded in 1787, a fact gathered from a poster for a cricket match in 1837 announcing the Club’s golden jubilee. If there was any written evidence of its official launch in 1787, it was destroyed by a fire at Lord’s in 1825. The present day Calcutta Cricket & Football has absorbed several sporting clubs over the centuries. Calcutta Cricket Club of 1792 vintage, Ballygunge Cricket Club (1864-1950), Calcutta Football Club (1872-1877) and the revived Calcutta Football Club set up in 1884. It is important to remember that these were not separate clubs but very much a part and parcel of the great and historic institution known today as Calcutta Cricket & Football Club. This entry was posted in Club Houses, Maidan/ Esplanade, Racial Profile, Sports/ Recreation, Ways of Life and tagged auckland circus gardens., ballygunge cricket club, British East India Company, calcutta cricket and football club, calcutta cricket club, cecil headlam, marylebone cricket club, nationalarmymuseum, old calcutta, vintage.